Erasmus+ KA107 (Non-European Countries) Staff Mobility for Training (STT) is a mobility activity that supports the professional development of administrative staff in Higher Education Institutions (HEI) in the form of training events abroad (excluding conferences) and job shadowing/observation periods/training at a partner HEI, or at another relevant organization in the program countries. Erasmus+ KA107 (Non-European Countries) Staff Mobility for Training (STT) might include a variety of activities such as job shadowing and International Staff Weeks organized by the partner universities (Important Note: Conference participations are not accepted as training activity within the framework of Erasmus+ KA107 Staff Mobility for Training). Erasmus+ extends beyond Europe, allowing for mobility from and to other parts of the world (between 33 Program and 84 Partner Countries). Program Countries are those countries participating fully in the Erasmus+ program. Turkey is one of the 33 Program Countries. Partner Countries cover the rest of the world outside the European Union. For each call of Erasmus+ KA107 Staff Mobility for Training, the list of countries/partner universities are updated in accordance with the Program budget allocated to METU. Countries as well as partner lists that can be granted change every year within the framework of the Program budget allocated by Turkish National Agency. International Cooperations Office (ICO) announces the application deadlines and procedures at least 20 days prior to applications. Announcements are made through ICO website and e-mails. Administrative staff who would like to make application are advised to check ICO website and e-mails regularly. The acceptance letter needs to be submitted together with the Application Form and language proficiency document to METU ICO prior to the application deadline. To find more information on the application criteria used in the Erasmus+ KA107 STT applications, please see the document attached. According to KA107 program rules, duration of training mobility ranges from 5 days to 2 months (max.) excluding travel time. However, as the Program budget allocated to METU changes every year, the maximum duration of the training mobility may subject to change. In order to learn the exact durations, applicants need to check the list of available budget/quota for each country, which will be specifically announced in each application call. For those countries which have a budget to support more than one week, it may be possible to allocate the whole budget for one administrative staff, if there is only one applicant. In case of having more than one application, the available budget will be shared among applicants according to program rules. If the training activity/training hours last less than the minimum requirements, the activity is considered as void by the funding body and the grant payment will not be made for the related activity. The activity must take place until the end of related project term, which will be announced by ICO. For instance, mobilities conducted within the framework of 2016-2018 project term, the training activity must be finalized by 31 July 2018. For outgoing training mobility period, the grant per day is 160 € for all countries. 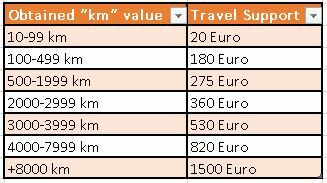 For the mobility period exceeding 14 days, the grant per day is 112 €. The distance calculator is used to determine the distance between the location where the staff is residing and the place of activity. The kilometers in distance calculated by the distance calculator corresponds to the round-trip and the amount does not get multiplied by two. Important Note: Participants receive 70 % of the total financial support at the beginning of their mobility period and the remaining 30 % when the training programme is over. For disabled participants, it is possible to receive additional grants to meet their specific needs. In order for the disabled staff to be given additional grants, METU ICO is required to request additional grants from the Turkish National Agency. The applications for additional grants should be made during the term of the contract, but in any case up to 60 days before the contract end date. The Turkish National Agency will evaluate each application specifically and determine whether the additional grant can be granted, and if so, the appropriate grant amount. In order to learn more about the application forms, you may contact METU ICO.